A nation which has the capacity to project dominating power and influence anywhere in the world, and sometimes, in more than one region of the globe at a time, and so may plausibly attain the status of global hegemony. Besides the requirement of a strong militarily, a power to become a super power needs a strong diplomatic and stable government, strong economy, a focused foreign policy, strong pool of scientists and strong base of research and education, and sufficiency in food and resources. We researched and analysed the potential super power of the world in one of our previous article “Top 10 Superpowers of The World” which is also one of the most read article on our journal. In this article we are going to analyse and list Top 10 science super powers who are growing bigger and may challenge the conventional science superpowers in the near future. Research Papers Published by Countries, 2009. Click to Enlarge. United States has been the lone super power since the collapse of Soviet Union in 1991. It remains the unchallenged global leader in science, research and innovation whose foundation has been set up by the high quality universities and educational institutes. Having seven universities in the list of top 10 universities in the world, and forty seven universities in top 100. United States of America is able to attract the creamiest layer of students from all around the world. A robust research environment, facilities, scholarships and high salaried jobs makes United States one of the best destinations for higher education. Not only universities, a large number of public and private companies like NASA and IBM, are making differences in the society by their state of the art pioneering researches in almost every field. Strongest research area of US is biotechnology. Largest in terms of population and second largest in terms of research papers published, China is the potential threat to United States’ supreme position in the world of science. China has been able to establish 11 universities in the list of top 400 universities in the world. Among which two are in the top 100 universities in the world. Number of research paper published in 2009 has seen a massive 400% growth when compared to year 2000. China’s main strength is material science. 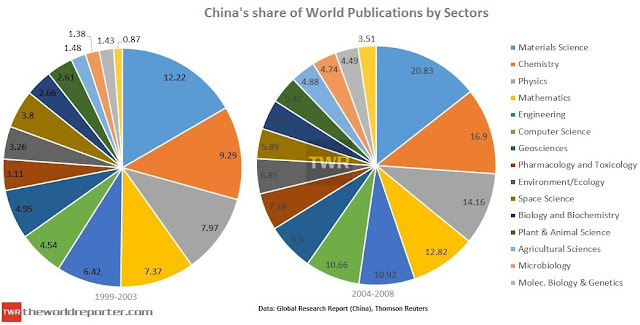 China has also seen growth in almost all the areas of research since 2003. China is leading the “space race” in Asia challenging Japan and India. China is also proud to have fastest train in the world CRH380A with its top speed of 302 mph (486.02 Km/hr) breaking the 300 mph barrier. However, the quality of research has been the issue in China. The country is also struggling with the attribute of innovation specially in the electronics, auto and military research fields. China has been accused by a number of organisations and companies around the world for copying their products be it vehicles, combat air crafts, electronic devices or other sensitive technologies. Another country which has a vast presence in the pool of top universities in the world after United States is United Kingdom. United States and United Kingdom have been dominating the list of top 10 universities in the world almost unchallenged for ages. Oxford, Cambridge and Imperial College of London are the names which have become classic over the centuries. UK has made extensive contribution towards early science and setup the foundation of various chapters of science creating opportunities for further research. Today United Kingdom is the leader in Europe when it comes to the number of publications, which is followed by Germany, France, Italy and Spain in the respective order. UK’s scientific collaboration with other countries and European Union will ensure its position safe as one of the leaders in the world of science. UK’s impressive 25% growth in the number of publication shows it still has an active scientific resources. One of the fastest growing economy, largest democracy, and many such facts makes India a potential superpower. With every analyst in this world having higher expectation with this nation, India has been relatively slow. However, being slow in the field of science did not prevent this country to astonish the billions in the world time to time with its scientific achievements. Which includes India attaining self sufficiency in food grains, becoming one of the largest exporter of food, developing a highly sophisticated space program which enabled India to find water on the moon’s surface, indigenously developing nuclear program and military hardware, and high quality exports in biotechnology, pharmaceuticals, and information-technology services. Indian institutes and universities are dedicated almost equally among all the major fields, still India’s one of the strongest area of research is Chemistry. If we compare India’s share of world’s publication from 1999-2003 with India’s share of world’s publication from 2004-2008 then we see almost all the sectors of research have experienced growth except Agricultural science, which is one of India’s spine. India’s contribution towards science and to the fields of mathematics, astrophysics, chemistry and life sciences dates at least two millenniums back. Later we saw contributions from Aryabhatta, Bhaskara and Brahmagupta who laid the foundation of the modern physics much before widely believed Europeans. India once again with its one of the largest pool of scientists in the world is tying to excel in the world of science by catching up with leaders. India’s recent contribution to science is rising steeply in contrast with the other nations if we compare each nations relative year-by-year growth since 1981 at a volume of publications standard of 100. The behaviour of the India’s curve shows why some analysts have referred to India as a “sleeping giant”. India with its great capacity was sleeping till 1990s as soon as it got up, its brilliant system almost immediately started giving the output almost on par with other nations of G8. If this trend continues then India’s productivity will overtake G8 nations in another 5 to 7 years. Brazil is another important member of the BRIC (Brazil, Russia, India and China). With its economy on the rise, Brazil also contributed towards science and technology with its one of the major focus on improving environment. Brazil’s strength has been recognised in biological sciences, including bio fuel production. In the year of 2005, Brazil launched “Empresa Brasiliera de Aeronáutica’s Ipanema” world’s first commercial aircraft to run exclusively on bio fuels. The world at present is not much aware of the science and technology base in Latin America. Mexico’s proximity to Unites States and Brazil’s rising economy has caused this region to develop a solid science base. Another giant in the South, Argentina is also in the race and catching up with Mexico and Brazil. 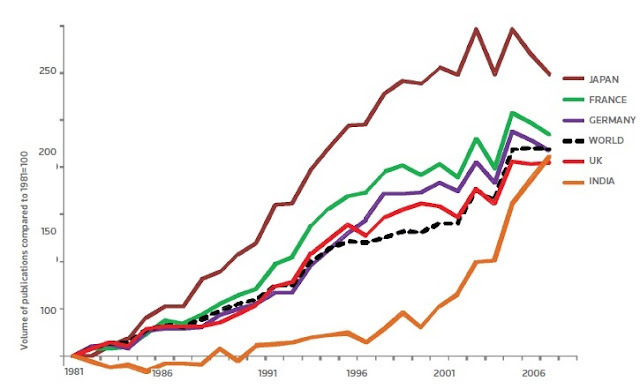 From the year 2000 to 2009, Brazil has experienced a 210% increase in the number of research papers published. Such an enormous growth does indicate young pool of scientists, new force of resources adding up, better efficiency in output from universities and institutions. Brazil’s year by year growth is much better than other countries in BRIC namely, India and Russia. Culturally and traditionally close to west Europe mainly Portugal, having land connection with United States and almost being at the same time zone as of US brings Brazil on a advantageous position to collaborate with the world leaders of science and technology. Brazil has become the representative of science and technology power from Latin America. If India was the “sleeping giant” which recently got awaken, Russia was an active and awakened giant which is going to sleep. After the collapse of Soviet Union, Russia experienced catastrophe and its contribution towards science seems to decline. Russia as Soviet Union is the one who began the new era of science and technology by surprising the world in 1957 by the launch of Sputnik satellite. In the “space race” Soviet Union had successfully outplayed United States. Russia has become the victim of critical brain drain, where a large number of talented resources left their country in search of better facilities, salary and funding. After the collapse of Soviet Union, science and technology has become less preferred destination for the younger generation compared to petroleum industry, language, and politics. This dynamic shift has resulted into the ageing of the Soviet scientists who are in Russia as young generation is not able to reinforce their science power. In 2009, Russia experienced only 3.57% growth in the number of papers published when compared to 2000. Russia has proved its supremacy once, and most probably it will once again jump back on the track of scientific research. Russia’s main strengths have been the core physics and space science, whereas the current trend is of life sciences, nano technology and environment where Russia needs to do a lot of catching up. Russia understands its lacking and has been collaborating in research mainly with Germany, US, France and East European nations to gain momentum. Russia has been doing really good in military science and technology and have been developing state of the art weapons still giving tough competition to United States. Russia is the largest exporter of its weapons to India compared to any other country, and India is the largest importer of weapons in the world. Which shows the quality and superiority of Russian weapons. As Russia’s economy improves and undergoes constructive reforms with its wider integration in the world trade, its highly enthusiastic public who has a sense of competition with the west specially with United States will definitely help boost its research programs bringing it back on the track. Japan is a G7 economy and enjoyed the status of being world’s second largest economy for a long period of time until it was overtaken by China and India recently by GDP (PPP). Japan has been traditionally the innovation centre and brought surprising and attractive products both in automobile and electronic sectors. Japanese companies till date have been bringing out their innovative hybrid cars which exhibit higher fuel efficiency. 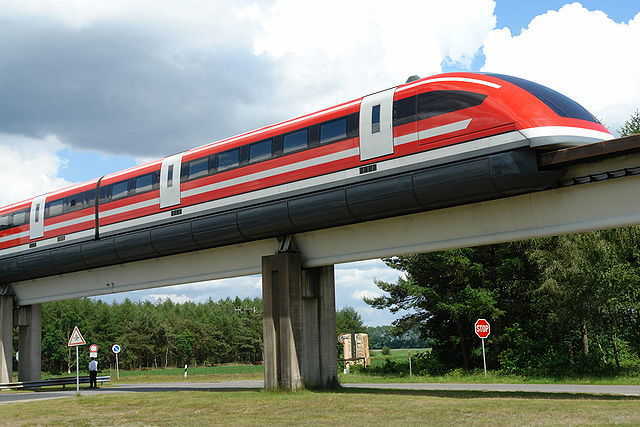 Japan also boasts third fastest rail in the world Shinkansen with a top speed of 275 mph (442.57 Km/h). Scientifically Japan had been the super power of Asia for a long time until it gave that position to China with India and South Korea almost catching up. Japan’s economy peaked in 1980s and since then there hasn’t been any appreciable increase or decrease in its volume of papers published. Just like Russia, Japan also experienced only a single digit growth in the number of papers published. From the year 2000 to the year 2009, there was only 8.3% growth. However, unlike Russia, Japan had always been ahead in modern science, be it nanotechnology or electronics. It already has an established base of high quality education and pioneer research labs. Its 13 universities are in top 400 in the world. With 2 in top 100 and 5 in top 200 universities in the world. All what Japan needs is human resources and encouraged young scientists. India and China produces one of the largest first class high quality resources in the world every year. All that said about Japan, it has a potential to become a favourite destinations for young Chinese and Indians who usually head towards US which is quite far. Japan can also collaborate with losing Russia, South Korea and rising South East Asia. These have been the traditional European power and were the super powers along with United Kingdom before second world war. Germany was a highly industrialized nation, unfortunately after the war, most of its sophisticated industries were taken over by west and Soviet Union for their benefits. Out of the three countries, Germany is leading in science and technology followed by France and Italy, with its volume of papers published in 2009 almost reaching close to that of United Kingdom. Germany had stunned the western powers and Soviet Union by its sophisticated weapons, air crafts and V2 rockets during the second world war. Today these countries within European Union have formed much collaborative educational system welcoming other prospective students from European Union. Universities from these countries invites students from countries like India and China in high number and fund their education. This way these universities are able to function with its full capacity. Germany’s strength has been mechanical engineering in its various forms like aerospace and automobile, German cars like BMW and second fastest train in the world Transrapid TR-09 with the top speed of 279 mph (449 Km/h), which is faster than the fastest train in Japan, makes it one of the advanced developed country, and the region as a whole, in science.